On a Saturday in April 1942, Major Heins of the Polish Army, the Commanding Officer of the unit, unveiled a plaque presented from the Poles to the community of Scone. 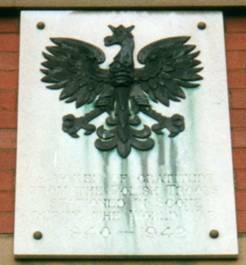 The plaque featured a Polish White Eagle, the National Emblem of Poland. 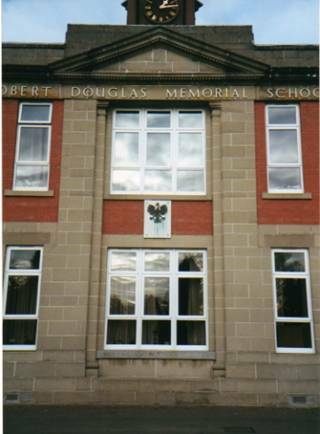 The headmaster of the Robert Douglas Memorial School, Mr. A Henderson, presided over the ceremony. The Polish soldiers, he said had expressed a wish to have the plaque erected on the wall of the school, as it was in this building that their canteen and English classes had been held. In his speech, Major Heins referred to the hospitality which had greeted his countryman since their arrival in the village. Major Heins was quoted as saying that, “We would like to think that you will remember us, and that when you are near this school where you taught us the English language you will look at this plaque and remember the Polish soldiers who always return love for love. The plaque was accepted by Councillor E. Suttie. In the early days of the War it is likely that one or more of the 1st Polish Army Corps Service Units was based in Scone. In February 1941, the 11th Workshops Section, consisting of 64 soldiers, including 6 officers was based here. At this time around one quarter of the strength of the Polish Army in Scotland (in total over 17,000 men) was located in Perthshire. Other Polish 1st Corps service units identified in 1941 in the Scone area, include the 11th Corps Vehicle Park and 11th Armament Park. In 1945 the Tram Depot in Mansfield Road was being used by the Poles as a Static Dump. By August 1945 this had been cleared. In July 1946, part of the Infantry Training Centre from Dunblane moved to Mansfield Park, Old Scone Camp, (about a mile west of Scone) but by August 1946 it had moved away. Farming courses were run at the camp. As a postscript Major Stanisław Heins, later promoted to Lt Col (Armoured Troops), survived the war and died in England in November 1964.